For the myopic and gullible minds, this article might be disgusting. Following the enslavement, degradation, mass killing and unlawful arrest of Biafrans by the Nigerian security operatives under the command of President Muhammadu Buhari, the Ohanaeze Ndigbo and their clique of politicians have refused to accept the fact that the freedom of Biafra is not negotiable. The continued advocacy for Nigeria’s unity by Ohanaeze whenever their lips are oiled, that is, when money must have exchanged hands can only come from those who are unwilling to change the status quo and get down to true constructive, creative, progressive and sincere, honest act of realistic nation building. They do not want to play a vital role to undo the dirty work the colonialists unwittingly did. It is quite unfortunate and pathetic that these old men, though know the right thing to do but are unwilling to do so. They are afraid of dying and would rather prefer women and children to continue paying with their lives. One thing they have failed to realize is that freedom is the most ultimate goal in the life of any mankind. It still baffles my imagination when I see obnoxious comments by Ohanaeze Ndigbo against Biafra restoration. It makes me wonder actually if the blood of Ndigbo flows through their veins or maybe the peanuts they receive uncountably from the Nigerian government to destabilize and sabotage Biafra struggle has beclouded their sense of reasoning and judgment. 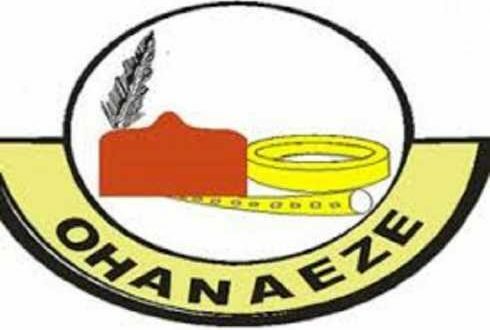 It is very pertinent to state categorically here to the Ohanaeze group and the Ohanaeze Youth Council as well, led by Isiguzoro to desist from their evil plot against Biafra and Mazi Nnamdi Kanu whom they see as a threat and obstruction to their greedy act of enriching themselves. Any form of evil plan whatsoever, be it recruiting of over 5000 un-identifiable people by Isiguzoro to stage a rally in South East or any where against Biafra and Nnamdi Kanu will be counterproductive as the perpetrators of this evil plot have never been identified as IPOB members or those who have the interest of Biafrans at heart. We will be on the watch and observe how the Ohanaeze and Isiguzoro unfold all their plans.